Gorgeous Remodel, Upgrades & Views! Rare 3 Bedrooms!! BEAUTIFULLY REMODELED! PRIME LOCATION! OCEAN & FAIRWAY VIEWS! VIEWS! VIEWS! VIEWS! 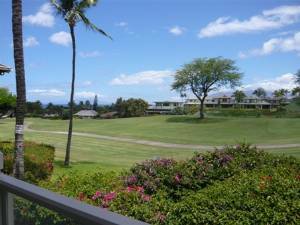 Magnificent ocean and fairway views from this 3 bedroom/corner unit with nearly 1698 square ft of living area (includes lanai) plus a wrap around lanai! 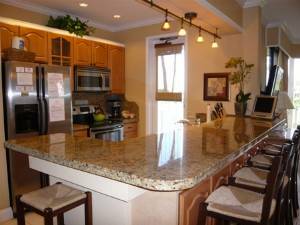 This is truly a beautifully remodeled and decorated unit. Once you enter this condo you will say "Wow!" New Furnishings, Granite Counter Tops, Bamboo Floors, Travertine Tiles, Oak Cabinets, Decorative Lights, Top of the Line Stainless Steel Appliances, New AC’s in ALL rooms, Newly Painted, New Beds, Flat Screen HDTV's in all rooms, even in the Kitchen AND MORE.... A MUST SEE!! This is the largest floor plan in the complex!! & Corner unit with PRIVACY!! PERFECT FOR COUPLES, FAMILY OR BOTH! Gaze at sunsets across the expanse of the 7th fairway, or sight an occasional deer scampering up the lawn in the early hours of the morn. Very Comfortable & Clean!! 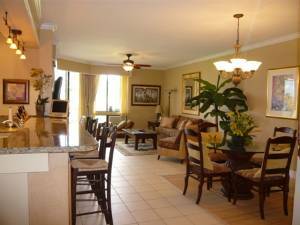 Relax on your own private wrap around spacious lanai. Feel the wonderful trade winds sweep across the Greens and take in the aroma of the beautiful Plumeria trees and Hawaiian foliage. 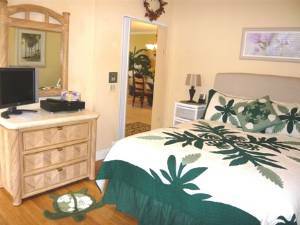 This extremely spacious three bedroom unit in the Wailea Grand Champions Villas comes fully stocked with all the amenities needed to make you feel as if you are in your own home. LOCATION! LOCATION! LOCATION! The Grand Champions have lush beautiful landscaping and amenities include 2 pools, Jacuzzi, BBQ and Security. This central Wailea location makes it favorable as you can walk to tennis, Shops at Wailea, casual to fine restaurants, World’s Top Beaches and Five Star Hotels. Whatever your vacation desires might be you will have a great time with your expectations delivered and memories of life time! Rice Cooker, Toaster, Linens provided, Iron,Golf Clubs, Cooler, beach chairs. 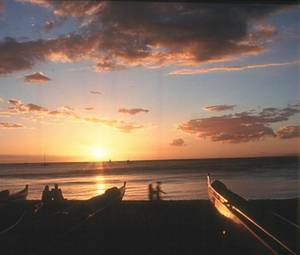 There are five championship golf courses, tennis facilities, upscale shops and boutiques, top-rated restaurants, and the "World-Famous" beaches Maui is known for. LOCATION !LOCATION ! LOCATION ! OCEAN & FAIRWAY VIEWS! 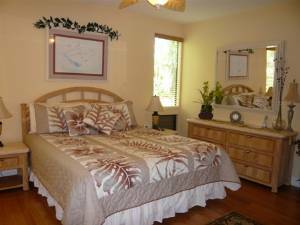 STEP OUT TO YOUR OWN WRAP-AROUND LANAI, ENJOY DINING OR THE SUNSET VIEWS!! 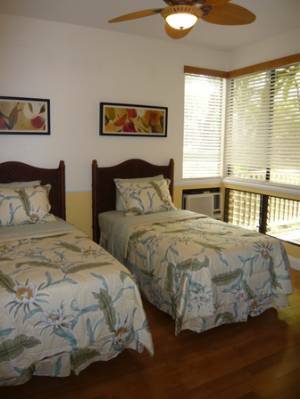 CUTE & COZY, HDTV & AC, BAMBOO FLOORS, VERY COMFORTABLE!! 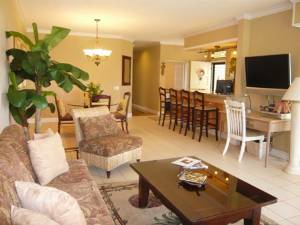 Walking Distance to beautiful Wailea Beaches. Deposit: A $500 deposit is required within one week of reservation. Tha balance is due 60 days prior to your arrival. Cancellations and Refunds: Cancellation Policy: A service fee of $200 will be charged for all cancellations. If the cancellation is received prior to 60 days of your scheduled check in date, a refund of the deposit minus the $200 shall be returned. Cancellations made 60 days or less in advance of the scheduled date will receive a refund if the accommodation is re-rented by another party for all of the same dates and at the same rate, and pro-rata refunds for partial replacement reservations will be provided. However, if I cannot rent the unit then no refund will be returned for cancellations made within 60 days of the scheduled stay.